The journey of the 1 Royal Gurkha Rifles runners for the Trail Walker 2017 has commenced. After the three consecutive victories over the title no doubt, this year the team will be working much harder to keep hold on it. 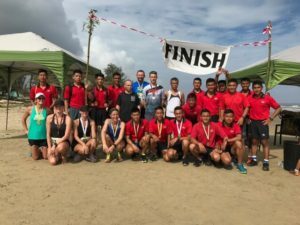 The 1 Royal Gurkha Rifles running team led by some fittest personnel of the battalion Capt Cassini and Sgt Santosh, have certainly taken a path to success. With a motto “Train Hard Fight Easy”, the team are all into their training with the positive attitude and for sure the winning mentality. On the due course of the training the runners got a great opportunity to participate at PANAGA HALF MARATHON. The event was organised by the PANAS (Panaga Athletics Society), who often organises various events here in Brunei and this event is one of their main priority, which is held annually. This physical/social event is designed to assess a runners physical fitness, mental robustness and determination, also to establish a friendly environment where the participants from diverse backgrounds of various ages come together and share their experiences and get chance to know each other. Even this creates an opportunity for runners to compete with the one with whom they never did earlier. More than 15 runners were signed up for the event. Our aim to participate in the event was to train the team and lead the team towards the victory of Trail Walker 2017 and also to maintain the (G9) community engagement within the locals of Brunei. Everything was set and the runners were just waiting for the day to come. The early morning on 11th of March, all the runners from different companies were driven by bus to the venue. We received our numbers and checked the route map as we arrived at the starting point. Most of the runners had already arrived and were preparing themselves before race, so did we. The clock was about to hit 0630 hrs as all the runners lined up at the starting point, very soon on a blast of the whistle the race began. The race started from the beach, the route was simply making a loop along the beach, metallic roads and finishes at the same point. The organisers have placed water points and guides to control traffics at various points, which made the event run more smoother. At around 0900 hrs all the participants have completed their respective distances and enjoying refreshments (fruits and drinks). It was the time for result then, a member from the organising team started announcing the winners and runner ups of all three distances of both male and female categories. As the results were being announced, the winners and runner ups in all the distances in male category were proudly captured by the runners. We all proudly went to the front and received our medals and rewards. Rifleman Bishal and Rifleman Ashim from C company were the winner and runner up of the half marathon. Rifleman Anuch and Sergeant Santosh from B company were the winner and runner up of the 10 milers. Rifleman Kamal from Support company and Rifleman Amrit from C company were the winner and runner up of quarter marathon. All the runners were also commended by the Commanding Officer, which even boosted their moral. Our look forward is to win the Trail Walker 2017, which has been the Commanding Officer’s main priority and so as ours.